Often, a glimpse of skin leaves a more memorable impression than the bared body; high necklines draw from this allure to impart a quality of innocence and refinement on the wearer. The longer collar draws eyes from the collarbones to up her neck, commanding attention to the bride’s face. 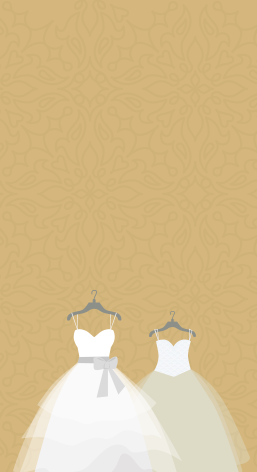 High neck wedding dresses run a wide range, with dress necklines skimming collarbones to circling the entirety of the neck. High, chin-brushing necklines are compatible with longer and more angular faces, while brides with rounder faces should choose a relatively lower neckline to avoid accentuating their full face shape. While the traditional high neck wedding dress covers the chest and collarbones, brides hoping for a coyer ensemble can choose a high-neck made of sheer material like patterned lace. These high neck dresses typically feature a strapless bodice and skirt, with a panel of more finely detailed fabric covering, but not obscuring, the chest and shoulders. Halter style high-neck dresses will allow you to bare your shoulders in a unique warm weather interpretation of the high collar. High-neck dresses can also strike a balance with shorter skirts for a youthful, fresh take on the style. A high collar frames the face, allowing for heavier styling on both the bride’s face and hair. Let your hair fall softly down your shoulders for a pure feeling, or pile your locks on your head and add long earrings to create a striking and sophisticated impression.